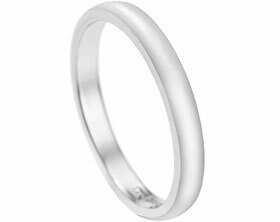 Classic in design, this lady’s wedding band has been made from 18 carat white gold and is 2.5mm in width. The band has a flat profile with a gentle outside curve. A polished finish and rhodium plating enhances the brightness of the metal.